Atiqah, with the help of Epic Homes and family and friends, built her home in just three weekends. A few years ago, Atiqah Nadiah Zailani was set on buying a small apartment for RM500,000 (S$169,392) in Petaling Jaya, Selangor. Before she could finalise the deal, she was sent on a job assignment to Tanzania. She had to put her high-rise dream on the back-burner, but while in Africa, the Kuala Lumpur born and raised young lady saw an alternate way of living. “The Maasai people (an indigenous ethnic group in Tanzania and Kenya) live in huts measuring less than 100 sq ft (9.3 sq m). That’s because a lot of their life happens outdoors. Indoors is just a place to rest. Since I’m also an outdoorsy person, I was leaning towards that lifestyle,” she says. And so Atiqah, who had no formal history with architecture or design, started sketching out her new home. “My dad is an architect, that’s as far as it goes,” says the 31-year-old who works as an international development consultant. Returning to Malaysia, she went online to search for available land. This was the most tiresome part of the process, Atiqah says, as she knew very little about where to find land for sale. Within six months, however, she purchased a one-acre (0.4ha) ground in Behrang, a town at the Perak-Selangor border, about 100km from KL. “It’s got all these tall trees and it overlooks Banjaran Titiwangsa,” she says of the view. Though Atiqah had a firm idea of the design she wanted, she needed professional help to make her vision a reality. 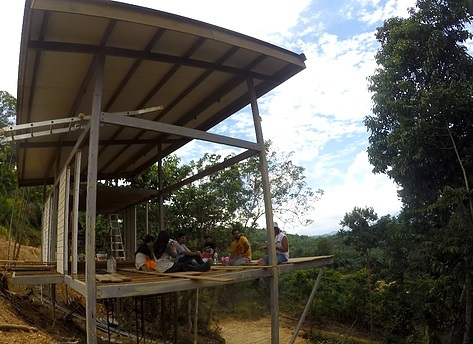 So when it came to actually constructing the house – sourcing for materials, structural concerns, etc – she hired architects and designers from Epic Homes, a social enterprise that mobilises volunteers to build homes for Orang Asli. “They tweaked about 30% of my original plan because I had designed my home for flat land. Mine turned out to be sloping land,” says Atiqah of the collaboration. 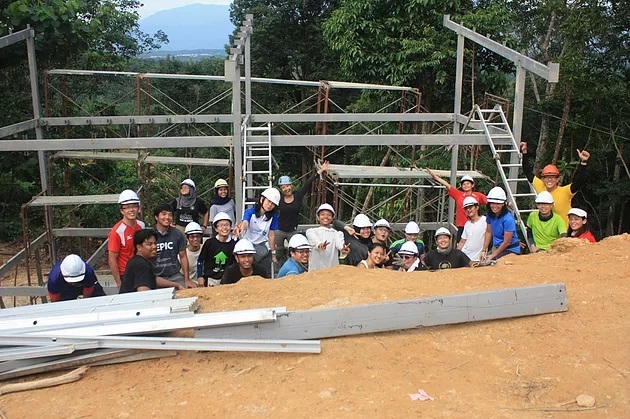 Then over three weekends in September 2017, Atiqah and a group of 20 to 30 people – comprising Epic Homes volunteers, her family and friends – brought her dream to life. At 520 sq ft (48.3 sq m), her home comprises an open floor living room and kitchen, a bathroom, and a veranda on the ground floor. The upper level is a spacious loft for her bed and work desk. The staircase doubles as a wardrobe. 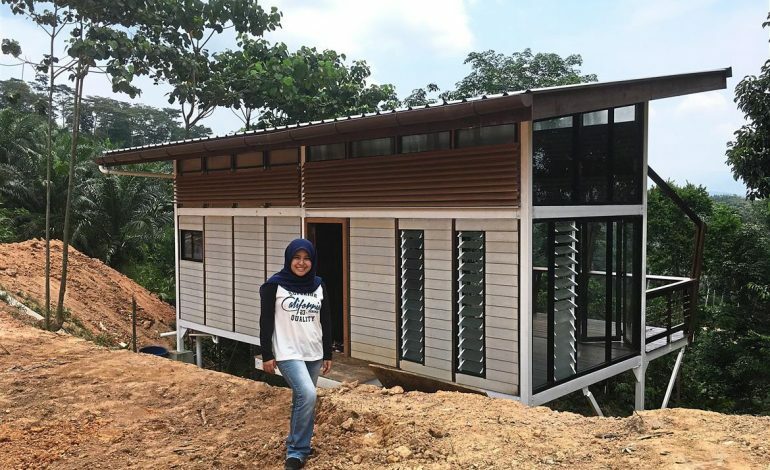 Though the structure may have been completed, Atiqah wants to take her time to furnish and equip the house before she moves in permanently, which she estimates will take five years. She plans to make each piece of furniture herself. On top of that, the eco-conscious youth is looking for ways to make her home self-sustainable, so she is installing solar panels to power her home, a rainwater collection tank for running water, and a composting toilet to recycle human waste.